The heir to Queen Elizabeth’s throne took to Twitter today to tweet anote live from his visit to the Digital Media Zone at Toronto’s RyersonUniversity. 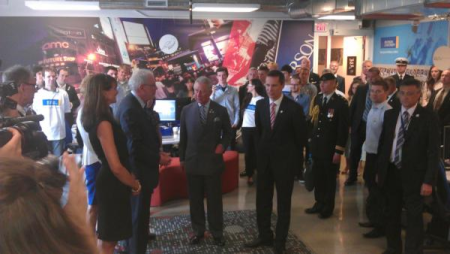 Prince Charles tours the DMZ inthis Twitpic posted by Ryerson University. “Engaging & impressive innovators @RyersonDMZ. Higher-ed isbeing taken to the next level #RoyalTour,” the prince’s tweet read. Charles doesn’t appear to have his own Twitter account, so his DMZtweet was sent courtesy of the folks who take care of Ryerson’soutgoing tweets. The Queen, if she was on Twitter, would clearly not be amused. But hey,at least this Twitter prankster is following the royal tour in Canada. It’s no shocker that the prince isn’t a Twitter user; he’s better knownforextolling the virtues of organic farming and traditional architecturaldesign than taking to the Web to engage his future royal subjects. Charles toured the DMZ with his wife Camilla on the third day of theirfour-day stop in Canada. They kicked things off in Gagetown, N.B. onSunday, followed by a Victoria Day (naturally!) celebration in TorontoMonday. The tour wraps up Wednesday in Regina.